Two bores make up the Eisenhower/Johnson tunnels; The Edwin C Johnson Memorial Bore is the Eastbound tunnel; the Eisenhower Memorial Bore is the Westbound tunnel. The Eisenhower Memorial Tunnel westbound bore hardly had gone into two-way service March 8, 1973, when the need for a second bore under the Continental Divide became evident. More than five years of hard work, "bad rock," and budget breaking had marked the completion of the first bore. When four lanes of Interstate 70 were squeezed to a single lane each direction through the tunnel, the predictable result was a bottleneck affecting summer tourist traffic and wintertime ski rushes, particularly the Denver-bound motorists on Saturday and Sunday evenings. Anticipating this, engineers at the Division of Highways had begun to design an eastbound tunnel in July of 1972. But almost three years of design were needed before the first of five construction projects was advertised for bids. The second bore is essentially a twin to the first. The tunnels share some of the same equipment such as the huge fans providing air exchange and the three pedestrian tunnels which connect the two main bores. The mining and support work began on August 18, 1975. Construction of the second bore saw its own share of weak rock and shifting load pressures within the mountain. The second tunnel, like the first, used multiple drifts in soft rock areas, on the proven theory that it is easier to mine a succession of small diameter tunnels than one large one. In one difficult area about 500 feet long, these drifts surround the main tunnel and are filled with concrete to protect its sides and crown. Additionally, the entire length of the main bore is encased in supporting steel and concrete. During January 1978, the legislators in Colorado's Fifty-First General Assembly passed a resolution requesting that the Highway Commission name the second bore for the late Edwin C. Johnson. As a member of the state legislature, as lieutenant governor, as governor and as a U.S. 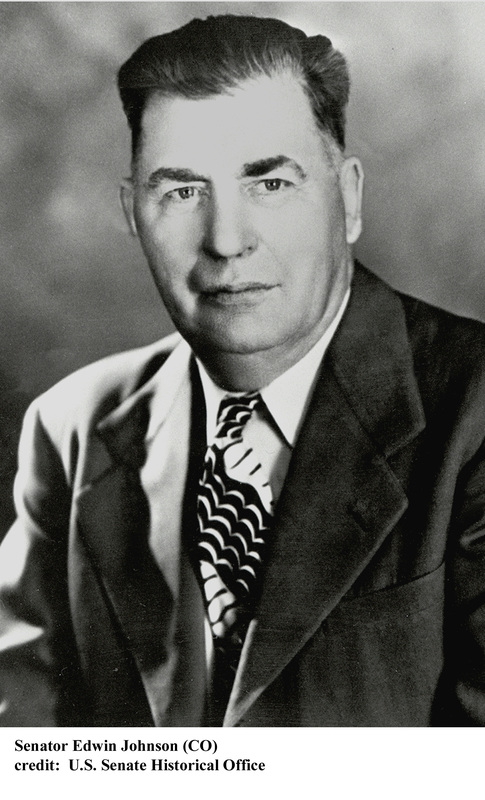 Senator, "Ed" Johnson had fought successfully for an interstate highway across Colorado. Statistics on the tunnel construction are awesome. More than 800 persons worked to build the Johnson Bore, some 480 of them in actual drilling operations. 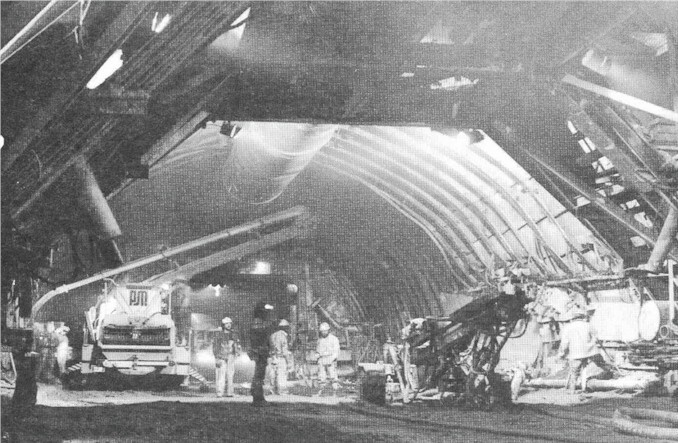 Construction of both tunnels has attracted international attention; engineers and rock mechanics from free world and communist countries alike have toured the site 60 miles west of Denver. The technical aspects will continue to fascinate engineering professionals. But for hundreds of thousands of highway users, the Tunnels will continue to save 30 minutes to an hour in drive time compared to U.S. 6 over Loveland Pass. Unlike that of the first bore, design engineers inside the Division were given the basic responsibility for overall planning, instead of going to an outside consultant. In addition to a statewide specifications committee of highway employees, there were two tunnel design squads, one of specialists in roadway, the other in structures. And, of course, the Federal Highway Administration was active in advice on and approval of the design. The Division retained two principal consultant firms for two phases of the design and construction, to aid and advise its own squads and committees. On mining and support the outside consultant was Leeds, Hill, and Jewett, Inc. of San Francisco. Ventilation consultant was Stearns-Rogers Architects, Inc. of Denver. These two stages of construction were contracted separately, as were an additional three: tunnel finishing; portal areas including tunnel paving, approach paving, and area cleanup; and landscaping. This arrangement was in contrast to that of employing a single prime contractor for the first tunnel. Original scheduling had called for awarding the first two contracts in 1974, but a pocket of environmental resistance surfaced in Summit County, where the west portal is located. Under one theory, the second tunnel would be merely an extension of the first project, and hence would not require a full-blown environmental impact statement. But to head off any future legal or philosophical difficulties, the Division of Highways filed an impact statement. To the time involved in preparing and waiting for clearance of the statement, there was added more delay from the uncertainty of federal funds in 1974. Then in early 1975 when President Ford released to the state $2 billion in previously withheld federal aid funds, tunnel financing was assured. The Division of Highways advertised May 1, 1975 for bids to be opened June 5 on the first of five stage construction contracts. The proposals for mechanical/electrical work were to cover the south tunnel ventilation fans (12 fans, including four standby), the fan control system, a standby generator at the west portal, propane standby systems at both portals, and an east portal passenger elevator. After the bids were analyzed by both the Division and the Federal Highway Administration, the Division awarded the Mechanical/Electrical contract to Howard Electric Co. for $6,246,228 on June 20, 1975. Completion time was 380 workable days. Howard's low bid compared to the Division of Highways' estimate of $6,203,428 or only 0.69 percent over the estimate. June 5, 1975 was advertising day for the second contract: mining, support, lining, tunnel drainage, and approach roads. In addition to special pre-qualifications, contractors were required to post a bid bond of $2 million by certified or cashier's check. Project completion time was 940 workable days. Bid opening day was first set as July 25, and then postponed for two weeks to August 8, 1975, to allow potential bidders time to incorporate revised data in their proposals. A team of engineer's reviewed the bids and the contract was awarded August 11, 1975 to Kiewit/Brown and Root at the bid price of $102.8 million. The Division of Highway's estimate equaled $110,559,807. Construction began August 18, when the contractor began moving onto the site. Actual mining started on around November 1, 1975.